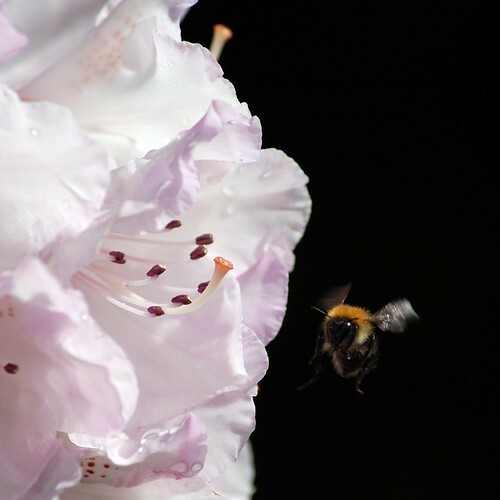 Getting busy with the garden, and buzzy with the bees. You may remember that ten months ago or so I confessed that I didn’t like gardening. Well I have an update. This year, I feel like I’m finding my way. I’m growing stuff. I’m enjoying going out there and looking at the things that are blooming. I’m watching, eagerly, the growth of my sunflower plants, and I’m excited by a trip to a garden centre. I’ve even watched bits of the Chelsea Flower Show with interest, and have bought, in advance, tickets for the Gardener’s World and Good Food Show. We went there last year, but it was the Good Food bit I was most interested in. I’m finding myself quite looking forward to the gardeners’ bit this year too. 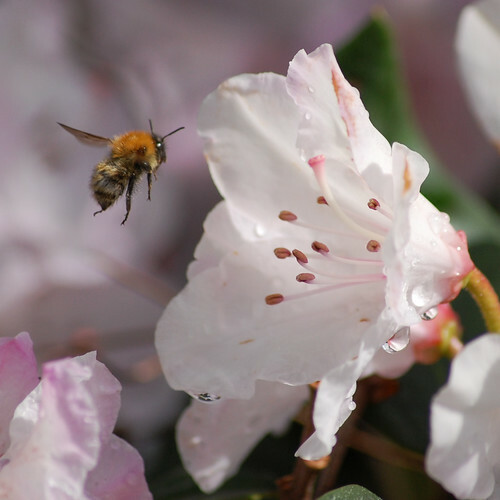 One of the things I’m loving most this year is the bees.I’ve spent hours out in the garden trying to get good shots of them, and today, in their post-rain frenzy round the rhododendrons, I got some shots I’m really pleased with. p.s. I’m still not digging the digging, though. That can still be The Bloke’s job.